Among thousands of royal families across the world, there are some, which standout the most, attract the most crowds in Dubai and have worldwide following in millions. His Highness Sheikh Ahmed bin Mohammed bin Rashid Al Maktoum, HRH Hamdan bin Mohammed Al Maktoum, HRH Sheikh Mohammed Bin Rashid Al Maktoum ruler of Dubai, Queen Elizabeth II, Princess Diana, Prince William and Kate Middleton are among them. These among a host of other royals are adored and respected in their respective homelands. These are the Royals who rule the hearts of nations. In parallel, beside nations, there are Royals within each industry. Not by decree but by “people’s choice”, chosen by millions of people within that industry. These industry royals are adored, loved and followed by millions – not only in the country they live in but the entire industry around the world. When it comes to the Monarch queens of the real world, some historians think the beautiful, but wicked, Aelfthryth (c.945-1000) was the first queen of England, while others believe Matilda (c.1102-1167), the daughter of King Henry I, was the first female monarch. In the fitness industry on social media – there is no doubt; If you are looking to find who is the original fitness queen, more than 20 million fans will attest to Michelle Lewin as the “Original Queen of Fitness”. The ‘Queen of Fitness’ on Social Media – Michelle Lewin – is all set to bring her magic to the Arab World and to the United Arab Emirates now. Michelle will arrive in Dubai in November to be an ambassador of the Fitness Expo Dubai that is being held to mark the UAE National Sports Day. Michelle is living the life of her dreams and she enjoys it. Her story – that of an immigrant, who, with a lot of hard work, effort and determination, successfully found her place in this world, resonates well with millions of people who come to Dubai to find and fulfill their own dreams. Michelle Lewin, born in Venezuela, migrated to ‘Venice of the Americas’ – Miami, from where she shot to fame across the globe. This is what most people want, but luck goes to those who have worked against all odds to do something bigger. How did she become so famous? Some people say, it was easy for her because she is gifted with “eye candy good looks” and research does show pretty women have it easier in life. The report, ‘In School, Good Looks Help and Good Looks Hurt (But They Mostly Help)’ says that from high school onwards, people rate better-looking people higher in intelligence, personality, and potential for success — and this often creates a self-fulfilling prophecy. The sociologists behind the study, at the University of Illinois at Chicago found women gain an eight per cent wage bonus for above-average looks and pay a four per cent wage penalty for below-average looks. The key of study is the self-fulfilling prophecy, in Michelle’s case – although she is naturally gifted in the looks department, hard work, being open to opportunities and not giving up were the reason she shot to fame. As you read further you will get to know her more and will know the odds that were against her. Michelle became a hit on social media as the ‘Queen of Fitness’ one fan at a time. This organic growth from one fan to next soon reached a tipping point, where millions of girls looking for motivation to live a healthier life started to look up to Michelle. It went from one, to thousands, to millions of fans who look forward to her next selfie. “I’ve heard a lot about Dubai, like wow… I am very happy to visit the UAE and meet all the wonderful people there… and, hopefully, I will motivate some in the region to be more fit than they are right now,” said Michelle. If you ask her, how come she is so famous, just like other great industry queens, she is modest about it. “I can’t really explain my popularity because it’s like… the people are in need of motivation and see me as a motivator. The photos I post or the videos I post… the followers, they really appreciate them,” she added. The early bird gets the feed is so true in her case. She works hard and she starts early. There are many who are popular in social media. However, Michelle has managed to start a revolution with her morning selfies on Instagram. “I found out that selfies is what the girls want to see. They could see that wow, this is the body that I want. “Also the morning selfies, they are the boom because that’s a very natural picture There are no risk it’s photo-shopped. I just get up without make-up on with the hair like this, but it gets most likes. They say, in order for something to go viral, it must have viral coefficient greater than one. Every person who sees it must tell others and the spread must be from one person to the next. This is the normal process, marketing experts gain their insights about what is spreading and how fast. What if everything you post goes viral? What if those who consume your content are actually waiting for the next episode, what happens to the likes and spread then? Her husband explains it best. Michelle’s husband, Jimmy Lewin, is also her manager and trainer. He also helps her manage her social media. “I will post a picture since Michelle is in the shower. And then we look here at how the numbers are moving. “One second, one like. One minute, 1,272 likes. Now 2 minutes, 20,142 likes, 3 minutes, 4,030 likes – this is how it goes”. How many followers does Michelle actually have? “All in all there are about 20 million followers,” Jimmy explains. “At my last event, it was amazing. I was like wow… look at what I have achieved! All these people have come just to see me, to take a picture. They really make me feel special,” added Michelle. “I don’t sing. I’m no actor. They simply just know me from social media. Just on Instagram, Michelle has more followers than Adam Levine from Maroon 5 – and she’s at the same level as athletes like Floyd Mayweather and Gareth Bale. “There are quite a few people who have found out where we live I know that a lot of people who are trying to enter our place and that’s about the only thing I find kind of scary. But until now nothing bad has happened,” says Michelle. It is a fact mastered by the best, When life gets tough, the tough get going. It is true and tested by those before Michelle and many more who will come after. This timeless proverb is true in every sense of the word in Michelle’s case. When the going gets tough, some peoples’ lives simply fall apart. What is it exactly that separates Michelle who thrived even with the presence of adversity from those who don’t? Is it her genetics? Did she find a bowl of luck? Or was it her pure willpower? Gandhi was the primary leader of India’s independence movement whose dad died at a young age but he initiated a form of disobedience that would influence the world. He turned hardship into a movement that would make him known as “the father of India”. Abraham Lincoln, one of the most recognized American presidents, failed in business, had a nervous breakdown, and was defeated eight times in elections before becoming president. Yes you read it right, he lost 8 times. Gandhi and Lincoln’s examples are extreme, but they demonstrate the different routes these great people took when they were faced with major obstacles. Every year, in America more than 3 million children will witness domestic violence in their home from those who are supposed to protect them. On the flip side many other people have gone through hell and back and are moral, happy, and successful. “When I was born, my parents separated. I grew up with my mother and my stepfather, but they too separated when I was 14 years old. I started to work – it was only my mother and I. I became an adult very early, because I had to. When my mother and stepfather divorced, we were left with nothing – absolutely nothing. Only an apartment full of cockroaches. We didn’t have enough food to live on,” Michelle said. “As a teenager, I was very complexed. I tried to cover myself. I was always wearing long pants. Always trying to find a way to cover my body,” she explained. She got so skinny that she weighed only 39 kilos. A very young Michelle decided to go with her mother to a gym. That day changed her life. “I’ve been working out since I was 17… and now at 29 I can say that okay, I got the body I want. In 2008, Michelle met her husband Jimmy Lewin, who saw potential in the Venezuelan girl as a model. After getting married in 2010, the couple decided to try her luck at modeling. “We went to Milan, London, and Barcelona – to agencies there. However, all of them said the same thing: You are very pretty, but way too short. They suggested we go to Miami,” Michelle said. In Miami, she entered her first competition and really liked it. But she got last place. Just like Abraham Lincoln lost eight times, yet never lost hope or the “will to fight” and finally became the president of United State of America. Michelle also was met with rejections, lived through them and finally became the “Queen of Fitness”. “That was the spark she needed by getting last place. She turned to sports and her success soon led to the next step – triumphing the social network. Ok you read this far and deserve to know her secret, which you can use to live a healthier life. “Michelle works out in the morning – does 45 minutes of cardio. In the evenings, she trains with weights. I have to force her to take a break,” says Jimmy. “The secret to her shape is not only the physical activity – it’s all about the nutrition. “Before, I was training a lot harder, but I ate badly. Today, I work out lighter, but I eat very healthy,” Michelle adds. I need to follow certain rules. And, what are the rules? Follow a strict and healthy diet – very balanced. One day a week, I eat whenever I want. 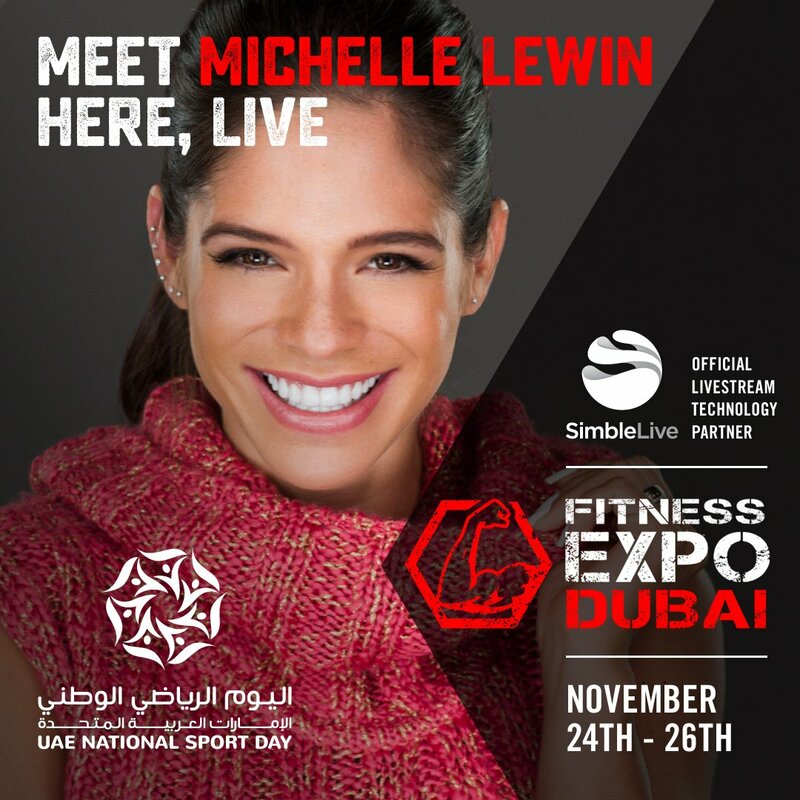 Fans and celebrities in Dubai UAE will be able to meet Michelle Lewin face to face in November. She is the brand ambassador for the Expo, which is backed by Arif Mirza Under the Patronage of His Highness Sheikh Ahmed bin Mohammed bin Rashid Al Maktoum, President of the National Olympic Committee and Chairman of the Mohammed bin Rashid Al Maktoum Creative Sports Award. Dubai will host, in line with the UAE National Sports Day, from the 24th to 26th of November, 2016 the largest exhibition of fitness in the Middle East, with the full support and collaboration from the Dubai Sports Council. Can’t wait to meet Michelle? Tell us why you should be the one to come meet Michelle for free in Dubai and we will make your dream come true. 50 most loyal fans will also get free tickets to the world’s largest fitness expo. Send your answers to social@fitnessexpo.ae with the subject line ‘I want to meet Michelle’.